VPNs In China: Behind Internet Crackdown, 'Game Of Cat And Mouse' Continues : All Tech Considered Savvy Internet users in China can tunnel under the "Great Firewall" using virtual private networks. Even as the government finds new methods to block VPNs, providers find ways to go around the blocks. Men look at computers in an Internet bar in Beijing in 2015. Even as the government finds new methods to block virtual private networks, providers find ways to go around the blocks. He says one of the policemen told him: "Somebody has discovered that you're selling circumvention software. That's illegal." Then they asked him to let them inspect his computer. Xie says the police told him to remove his VPN from the Apple App Store. Xie didn't want to go to jail, so he complied, and the cops left. He said he could have put the VPN back later. But not long after that, Apple removed all VPNs from its China app store. The apps remain accessible in Apple app stores outside China. 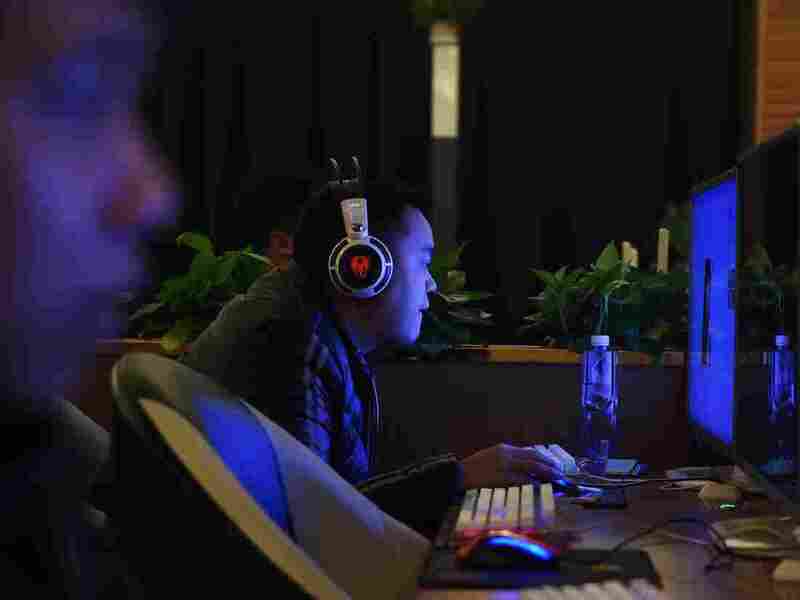 The move is part of a crackdown by Chinese authorities on any efforts by its citizens to skirt the "Great Firewall" — the world's most sophisticated system of Internet content filters and censorship. In the short term, the crackdown appears driven by the Chinese leadership's intention to purge the country's cyberspace of dissenting voices and potential distractions from this year's Communist Party national congress, at which President Xi Jinping is expected to get a second five-year term. But the crackdown may well extend long past the congress. It reflects China's rulers' view of "Internet sovereignty," which holds that each country has the right to stop unwanted information at its borders. Software developer Xie notes that China's government has tried to block citizens' access to VPNs for years. What's new are threats to punish VPN users within China. New rules in southwest China's Chongqing city, for example, say that unauthorized VPN users can be disconnected from the Internet, although the rules do not seem to have been rigorously enforced. There are concerns that the ban could eventually be rolled out nationwide. Apple is not the only prominent foreign company to be affected by the crackdown. A Chinese partner of Amazon recently instructed users of Amazon's cloud computing services in China to delete their VPN apps, or be disconnected from the service. Apple says it is just complying with Chinese law (It gave a similar explanation earlier this year when it removed The New York Times' English and Chinese-language apps from its China store). "We would obviously rather not remove the apps, but like we do in other countries, we follow the law wherever we do business," Apple CEO Tim Cook said on Tuesday. "We're hopeful that over time the restrictions we're seeing are lessened," he added, "because innovation really requires freedom to collaborate and communicate." But not everyone is sympathetic to Apple's explanation. "Restrictions like these are a threat to free speech and civil liberties," says Harold Li, vice president of ExpressVPN, a British Virgin Islands-based company. Following Apple's decision to remove his product from its China App Store, Li says he and his company were "surprised and disappointed, because we believe in the importance of VPNs like ExpressVPN for ensuring that there's a free and open Internet." Li says that for the past eight years, his company has managed to keep providing VPN services to customers in China, despite government attempts to block it. Even as the government finds new methods to detect VPN traffic and block it, providers find new ways to disguise VPN traffic and end-run the blocks, and it's not clear that either side has a decisive advantage. It's "an ongoing game of cat and mouse or whack-a-mole," Li says. The Chinese government insists that companies in China can apply to use unrestricted connections to overseas websites. But at a recent press conference, Ministry of Industry and Information Technology official Wen Ku issued this warning: "We strictly forbid the transmission of harmful information or terrorist information over the Internet." By harmful information, the government often means dissenting political views. It blocks access to overseas sites, including Google, Twitter, Facebook, YouTube and the BBC, just to name a few. Zhou Shuguang, a citizen journalist and blogger, who goes by the penname Zola, believes that the Chinese government has the technical ability to seal the country's Internet off from the outside world, thus creating a giant internal network, or intranet. But he says they're not prepared to go that far yet. "Authorities are not seeking to prevent 100 percent of the people from evading censorship. They're just trying to keep things within their control," he says. By threatening punishment and blocking VPNs, China appears to be calculating that it can limit the use of VPNs to a number of Internet users that is not large enough to significantly threaten the government's control of information. Zola notes that China's information technology sector, among others, is highly reliant on VPNs, and China is not going to risk crippling the Internet economy with total censorship. He says China's main goal in shutting down VPNs is to shape public discourse. "The Chinese government has always paid a lot of attention to controlling the agenda," he says. "They want to ensure that other topics don't interfere with the topics they're focusing on." He also notes that in times of emergency, China's government has the legal authority to completely shut down the country's Internet. China's western region of Xinjiang did just that during ethnic rioting in 2009, but the whole country's Internet has never gone black — yet.